Recently I purchased the above pictured Mortar & Pestle (European term) or Molcajete (Latin term) for my birthday. I was able to buy the mortar and pestle at Costco for $14 and some change. This is a seasonal item in our Costco, probably if you were to go to a Latin Grocery store you might find one. I went to a nearby Latin Grocery store and asked the clerk about finding a Molcajete and she ignored me. I could't tell if it was because she did't speak English or because I was a Gringo. 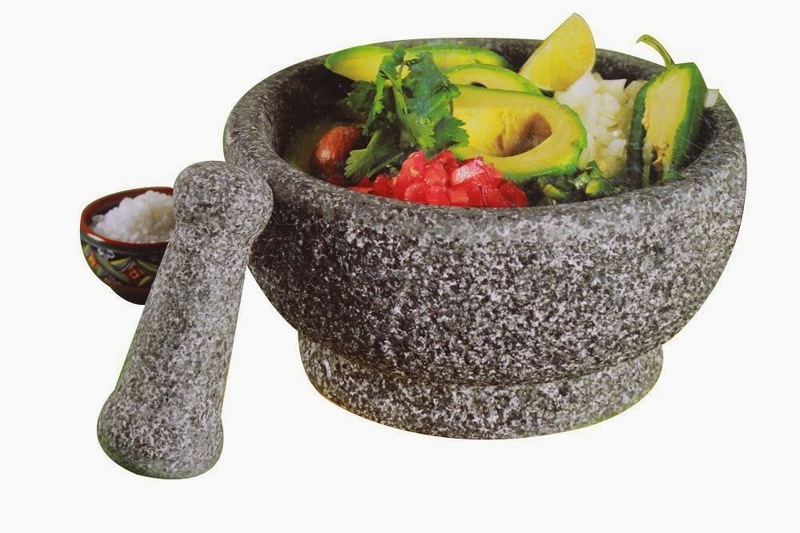 I wanted a Molcajete style Mortar & Pestle because they are bigger than a traditional European Mortar & Pestle. Ikea sells a Mortar & Pestle, but it is small. I have seven people to feed, (sort of) and so I wanted a big Mortar & Pestle. Now to using this particular Mortar & Pestle. It comes unfinished. What do I mean by unfinished? I mean the finish is straight cut stone and it needs to be finished before using or you will have pieces of stone in your food. I opted for the cheat method versus the traditional method. At Home Depot, I purchased a 3" wire brush attachment for a corded drill. On our balcony, in the cold, I scoured the stone surface and tried to smooth the surface as much as I could. Then I rinsed it, let it dry and repeated two more times. After the wire brush/rinse routine, I then used the traditional grinding rice method to remove the last remnants of stone dust. Grinding rice is therapeutic. Yes it is, because you see results as you grind that poor defenseless rice into dust and this doesn't hurt anybody. I made guacamole the first time I used it. Oh my goodness, is that so worth it. I made a paste with cilantro, onion, and the jalapeño, before adding the avocado and lime juice. Wow, I love guacamole made this way. On the next day, I made the pesto recipe I posted, and again I was blown away by how wonderful the flavors are heightened by the simple act of crushing them versus cutting them in a food processor. Having made pesto in a food processor and now in a Mortar & Pestle, I wholeheartedly endorse this Mortar & Pestle/Molcajete from Casa Maya. In my Amazon store widget you will find a link to the Molcajete I have and use.